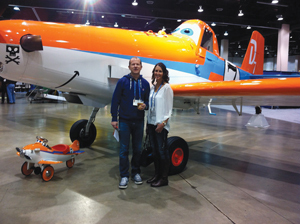 (Submitted Photo) PLANES: Shaun and Stacey Kinniburgh pose alongside a model of the Disney ‘Planes’ character Dusty Crophopper, an Air Tractor AT-301 crop duster airplane. This year, an aerial business is getting a sky-high honour. Kinniburgh Spray Service Ltd. is being awarded the Taber and District Chamber of Commerce Small Business of the Year award for 2015. During the growing season, Kinniburgh Spray Services also operates extensively throughout the Vauxhall area, making use of the M.D. of Taber Vauxhall Airport. Operating since 1952, the business started when three Kinniburgh brothers – Jack, Scott and Ring – decided to use an aircraft to spray fields instead of ground spraying in an open cab truck. They already had an aircraft, purchased alongside with a neighbour, and enjoyed it so much they went into business. “We do aerial application. I won’t say crop dusting anymore because we don’t do that,” said Shaun Kinniburgh, owner of Kinniburgh Spray Service. Now, three generations later, the family business has a variety of planes at their disposal, with members flying everything from air tractor to Boeing 737s. Kinniburgh, who is also the president of the Canadian Aerial Applicators Association, took over the family business five years ago. Since then, the spray service have been steadily updating over the last five years, doing things such as getting new planes, reducing their environmental impact, becoming paperless and streamlining their services from the loading areas to the aircrafts. When he learned that the business had received the Small Business award, he was very surprised. Although admittedly unsure on why they were nominated, Kinniburgh is quick to credit the recent upgrades and workers for their continued success. In addition to aerial application, which keeps them busy throughout the summer, the company also sells crop protection products and offers aircraft maintenance services, which they are particularly focused on at this time of year. Kinniburgh Spray Service will formally receive their award during the awards dinner on Jan. 15, 2016. Other award recipients this year include Molnar Farms (Spirit of Taber), Doug Emek (Outstanding Citizen of the Year) and Wade’s House Moving and Heavy Haulers (Customer Service Excellence).